I cannot begin to tell you how many games I have lost due to Defender of Argus. Some of these cards will be nerfed soon, but not all of them (including Defender of Argus), and I’m not even convinced the nerfs will hurt their inclusion in nearly every deck. As I have said before and will undoubtedly say again, sometimes Hearthstone can be played by a monkey. Sometimes you only have one rational move, and sometimes you will win no matter what you play because your opponent got screwed by RNG. And vice versa. But none of this should suggest there is not room for skill, acumen, and calculated risks. It’s not about seeing the same pieces day in and day out, it’s how those pieces interact with one another. 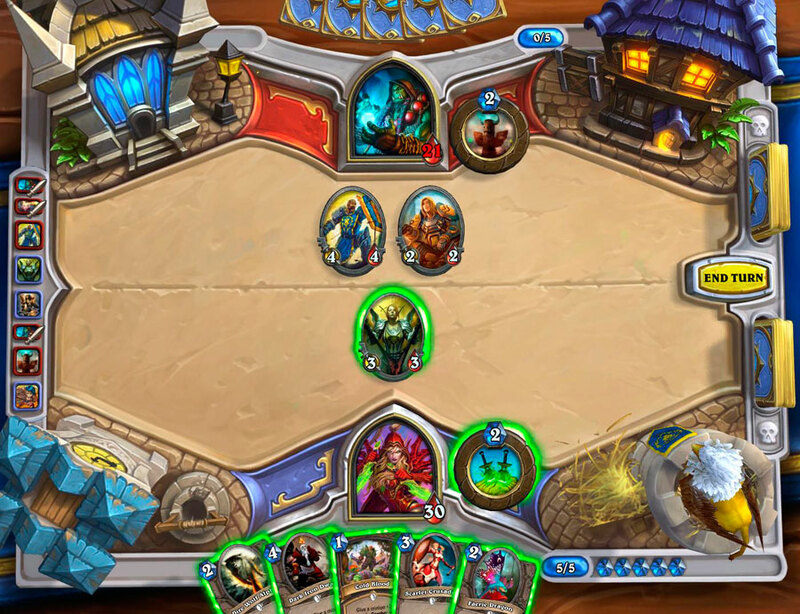 Hearthstone has its issues – Blizzard can’t pretend that Mage isn’t OP for too much longer – but a metagame revolving around X number of cards isn’t one of them. It would be better if more cards were viable, sure, but there is plenty of meat and marrow on these bones. Posted on December 10, 2013, in Hearthstone and tagged Best Cards, Blizzard, Metagame, Nerf, Strategy, Tobold, Who's the Beatdown. Bookmark the permalink. 3 Comments. Working as intended. This game is based on World of Warcraft, after all. I’d go with daggers ability, and then the 3/1 with divine shield….that’s just me though! You could also make a good argument for buffing the ssc with the dark iron dwarf…but i think he would be more valuable til saved until next turn….at least you would be sitting with a 3/1 and a dagger with a scarlet crusader vs a 2/2. Then again, i like board control…if you don’t care about that you could drop the wolf, but he’d get taken out, and the shaman could run a ssc and simply take out your wolf and have board control left over. That’s just my estimation. I agree with your entire post though…there’s very little room in this game for creativity, and i’m beginning to find that frustrating.